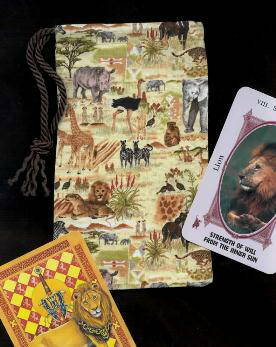 Regular Tarot Bags - Serengeti Regular Tarot Bag - Tarot Bags, Tarot Cards, Cloths, & More! From Aesop's Fables to modern movies (i.e. Ghosts in the Darkness, 1996), certain wild animals have always fascinated humankind. Animals like the lion, the elephant, and the leopard have been represented in myths and legends throughout the centuries and around the world. Naturally, humankind has sought to learn from these mythic creatures. 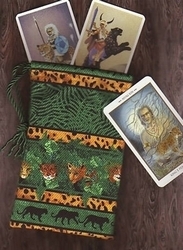 The fabric for this tarot bag features many animals that commonly appeared in legends and myths and are considered companion, spirit, or totem animals and guides. 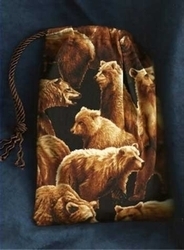 At least ten wild animals appear on each bag. 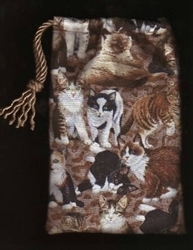 The animals and birds on this fabric include the lion, rhino, elephant, zebra, giraffe, leopard/cheetah, impala, antelope/oryx, meerkat, partridge, monkey, and ostrich. 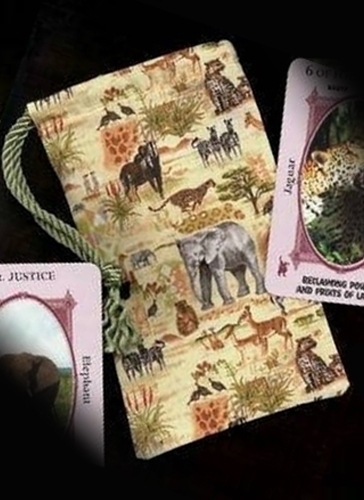 Such a fabric makes a wonderful match for tarot and oracle decks like the Roots of Asia Tarot, Animals Divine Tarot, Australian Animal Tarot, Animal-Wise Tarot, Tarot of the Animal Lords, and the Beasts of Albion decks. Other Shamanic or animal-totem decks would coordinate well also. 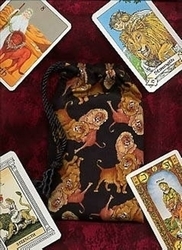 Size: Regular, fits tarot decks of 3 x 5 inches or smaller.